This is awesome. Alvin Garcia Flores had been born without an arm, and the folks at Limbitless Solutions printed up and provided him with one in a presentation before his entire school. Members of the 501st Legion’s Central Garrison (which serves Iowa, Minnesota, Nebraska, North Dakota and South Dakota) were on hand to present Alvin with his brand new arm. Disclaimer: I’m a member of the 501st’s New England Garrison. He wrote to Limbitless. The organization agreed to build the arm. 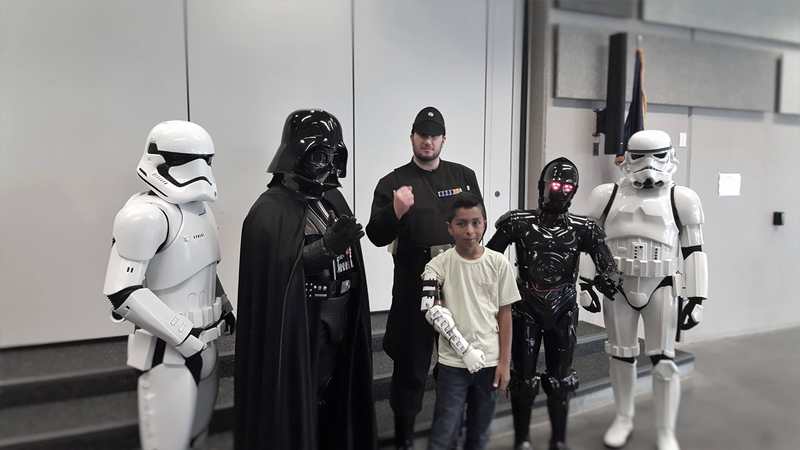 The 501st Legion showed up with Darth Vader and a couple of stormtroopers, and presented Alvin with an arm modeled after that of a stormtrooper’s arm.